LAHORE – Film director Syed Noor of an upcoming film lauding extra-judicial killing in the name of Islam denies any similarity between his film and last month’s killing of Punjab governor Salmaan Taseer. For Pakistanis, the scene may evoke memories of the moment Taseer was killed by his own security guard last month for speaking out against the blasphemy laws, which have long been used to carry out personal vendettas and persecute minorities. Instead, it’s a poster for upcoming film ‘Aik Aur Ghazi’ (One More Holy Warrior) by eminent screenwriter and director Syed Noor, which he says he plans to release within two months. The killer in Noor’s film, a convicted criminal, achieves redemption and hero status through murder. 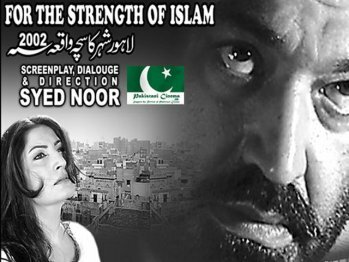 Though director Noor denies any similarity between his film and the killing of Taseer, the film’s expected commercial appeal is indicative of growing acceptability of extrajudicial killing in the name of Islam, argue experts. Director Noor, a 40-year veteran of Pakistan’s film industry (known here as ‘Lollywood’) is famous for a string of romantic hits with racy song-and-dance numbers featuring scantily clad actresses. Like all good Lollywood films, ‘One More Holy Warrior’ includes a romantic love interest for the hero, Tariq “before he went to jail,” says Noor, who recently attracted attention for publicly criticizing a Muslim Pakistani actress for appearing in an Indian reality TV show and developing a love interest with an Indian actor. “My film has nothing to do with Salmaan Taseer,” he says in an interview at his studio, adding, “The villain in my film claimed he was the prophet of Islam. Salman Taseer was just trying to help a woman,” referring to Taseer’s efforts to free a Christian woman, Aasia Bibi, from jail where she awaits a death sentence for blasphemy. Does he not have a subject to deal with other shortcoming in the society instead of making a film of this nature? very good .i slam to you. allah bless you & your family. What tolerance? The islamic tolerance or western tolerance of haram, kufr, homosexuality, free-mixing, leaving Islam, fighting felllow muslims. We need to wake up – are we preparing for ahkira by pleasing our lord or planning to live forever in this duniya? NOor Sahab aisy hassas topics per films banan ap ka hi fun he. lekin kya hi acha hota k ye film ber waqt karachi me b release hoti. syed noor sahb kuch khuda ka khof khao. kanjri nachana apka kaam hai islam ka flag kaha se mil gya tme. Excellent movie great work loved it ….. This film is a great movie. Really impressed. Why do the critics ignore the recent "Boul" movie which alot of abusive statements and wrong statements against Islam are used. Shame on GEO and all its CIA Agents. Noor sahib yeh kiya kiya aap nay? it will be very successful movie.